Christian and Brian. We'll miss you guys! We will miss all the staff of Bocas Marina who were wonderful and became good friends. We wish you and your families well. Bocas is great for provisioning and repairs, we recommend it highly. While there we replaced our VW/Audi/Pathfinder engine with a new 54hp Yanmar 4JH5E that is so quiet and starts instantly. 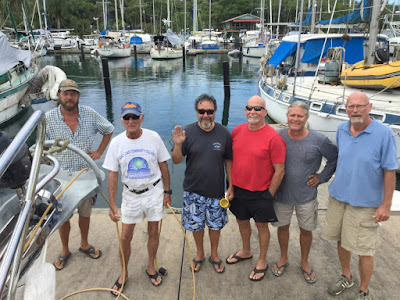 We hauled Kanilela out at the Almirante boat yard and did the engine swap ourselves. The yard is set in a filled clearing behind a mangrove coastline. It has both a mobile crane and travellift but is off the electrical grid with a genset running only during working hours. Again, Dave from Goenplaces II came to the rescue and loaned us his Honda 2000 genset so we could run our air conditioner while hauled out. Without it the month we were there would have been very difficult so he saved me from a mutiny. The chitres (no-see-ums) would have been unbearable. We had 4 new agm house batteries shipped down from Florida and they are performing perfectly. 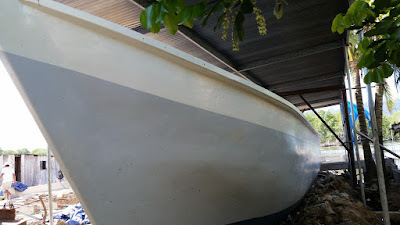 Our pvc/aluminum inflatable dinghy split a seam last month but we very were fortunate that a friend in the marina, Shannon on s/v Elsewhere, had just bought a new hypalon/aluminum inflatable that did not fit his big catamaran. In discussions we decided to buy his brand new 15 hp Yamaha engine as well. The new dinghy flies so we can get 4 people to snorkel/dive sites in minutes. Thank you Shannon. As well we had parts and new equipment too numerous to itemize both purchased in Bocas, shipped from Florida and carried in our luggage from Vancouver. 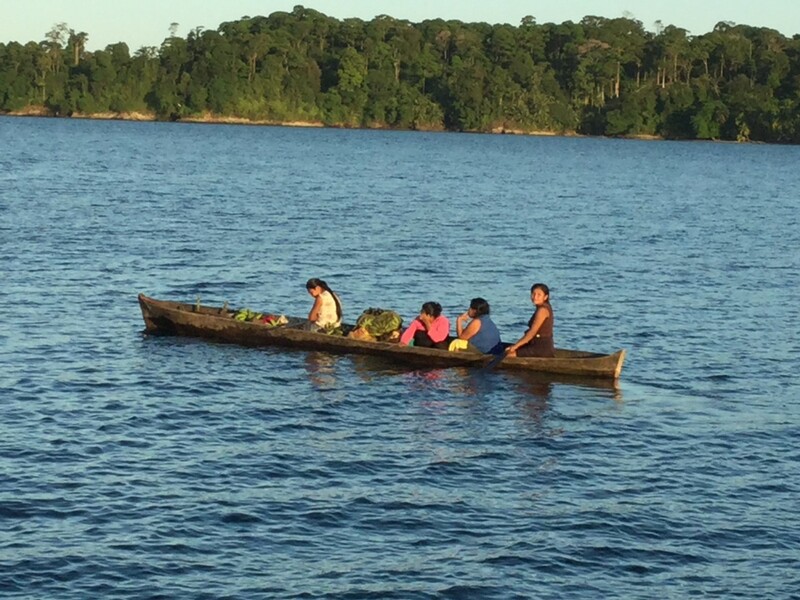 Kanilela was ready for her first crossing since arriving in Bocas 2.5 years earlier. 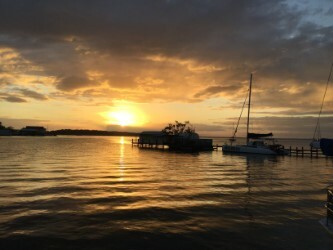 We left Bocas on Thursday but only sailed to Bluefields Lagoon about 20 miles east of Bocas to spend two nights at anchor to relax and make sure that all systems were working. 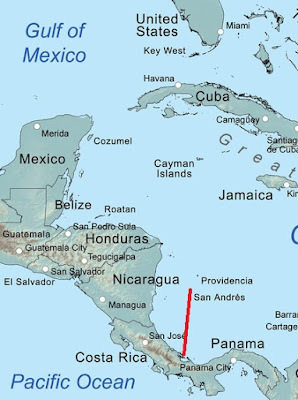 The trip to San Andres is 200 miles so the stop also ensured we would arrive on Monday, not the weekend. Bluefields, named after the Dutch pirate Bluefeld who frequented the bay, is beautiful. There are a few indigenous villages in the lagoon with numerous possible anchorages but we chose the first one on the SW corner after taking a leisurely cruise around the long bay. We knew that our friend Ignacio who runs the shuttle panga at Bocas Marina owned the point area we were anchored beside. 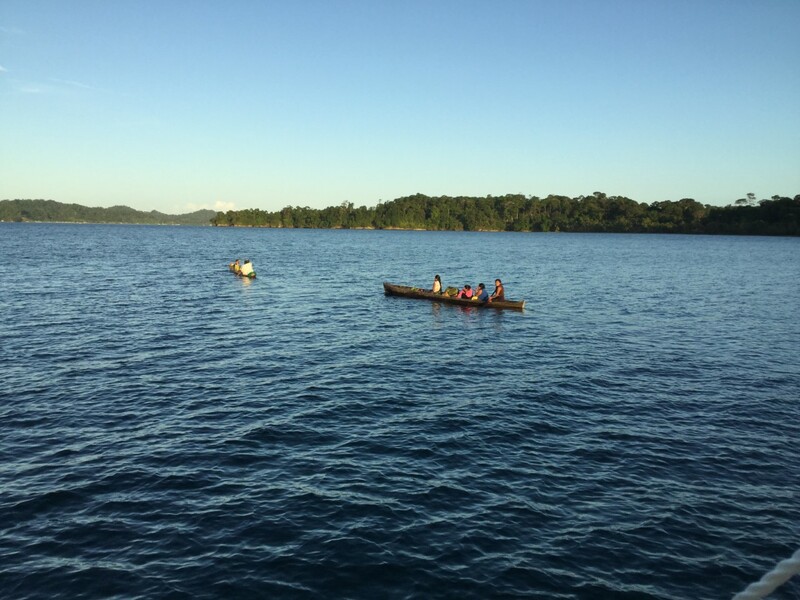 Although Ignacio lives mainly in Bocas, his wife and some children and several grandchildren live on the bay we anchored in. We spent a leisurely morning and early afternoon doing a few boat chores while watching a group of five kids on the jungle lined beach with a cayuco (a dugout canoe) pulled up the bank and another cayuco with three people fishing along the coast. The ones fishing were in the hot sun for several hours without being able to move around in the cayuco. In the afternoon we watched as the fishing cayuco joined the other on the beach and large bunches of plantains, (starchy bananas), old coconuts and yuccas were loaded into both cayucos. They then left the beach and paddled out to Kanilela with four people in each. 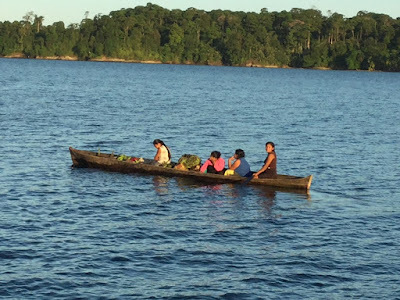 They were a middle aged woman who had been in the fishing cayuco, six girls ranging from late teens down to a five year old and one young boy. The cayucos were loaded with plantains, coconuts, yuccas and a few dozen fish they had caught. We told them we knew Ignacio and their faces lit up. In the course of a conversation in my Spanish and the older ones explaining to the young ones in their Indian dialect we learned that three of the girls and the young boy were Ignacio’s son’s children. Ignacio was their abuelo they proudly said with shy smiles. After a short, smiling visit they departed paddling towards the village across the bay that they could not have reached before darkness had closed in. As an aside on the Panamanian indigenous cayucos. They are carved out of a single tree and can range from as small as six to seven feet up to forty plus feet. difficult to get a shot that gives its true perspective. In the 2.5 years we watched a very big one being carved and then finished in Almirante. months of sanding and finishing. It was nearly ready for launching on my last visit to the Port Captain in Almirante to get out Zarpe documents to leave Panama. 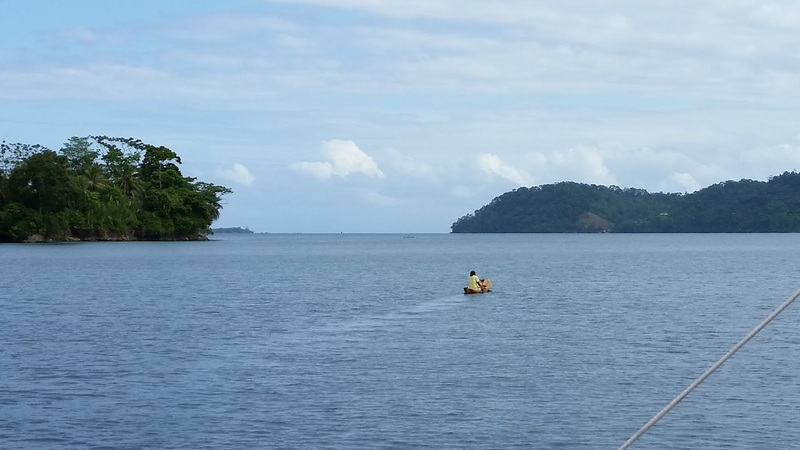 We were often amazed by six or seven kids out in the bay at Bocas playing in a cayuco with only two inches of freeboard and someone constantly bailing. As you travel through the archipelago the cayucos are ubiquitous, with men and women out fishing and children playing. The largest have outboard motors but most are paddled. While in Dolphin Bay we anchored near an Indian village that had small open deck restaurant over the water. The fish tacos we had were excellent and the beer was cold but most interesting was the local Indian who came up in his cayuco and ordered a beer. He stayed in the cayuco with the restaurant deck at the perfect armrest height. In the course of an hour or so he had three beer and then left paddling a few kilometers across the bay. He never left the comfort of his cayuco. 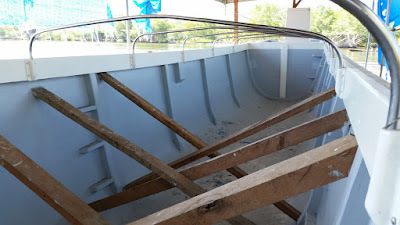 In Laguna Bluefield we saw several brand new cayucos that were the beautiful honey brown colour of new wood. All very reminiscent of our time in Alert Bay off Vancouver Island when twenty plus first nations dugouts arrived on a coastal journey north. 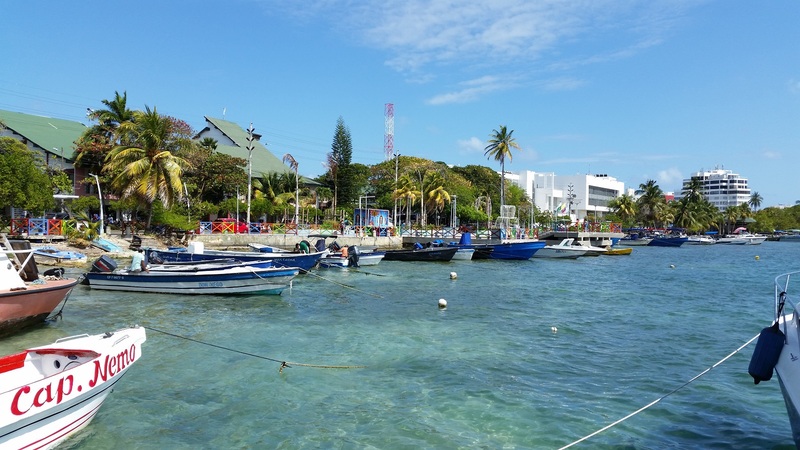 We left Bluefields at about 4:00pm for the two nights and one day trip north to San Andres. The Bocas coast is a world renowned surfing area with breaks exceeding ten feet so you have to choose your departure time well. Our forecast was for waves to six feet, wind light. The winds from the north were light but the waves were in the ten to twelve feet compounded by the reflected waves off the various irregular coastlines. A veritable washing machine. Motorsailing into the wind, pitching and rolling in all directions for our first time back at sea in 2.5 years. Although we had regularly added biocides to our diesel tank and because it had been near full I thought the condensation and sludge issues would be minimal. The constant rolling and pounding stirred up our fuel tanks that in fact were a mess. In the middle of the night I drained off water and sludge from the two engine filters, 10 and 2 micron, and went back to our day tank. After running through the day tank I transferred fuel from the main tank to the day tank through our 20 micron Recor 500 filter. After running for several more hours it was apparent that I would have to change all the filters to be able to continue. This is not a fun job in a sweltering engine room over a hot engine in rolling seas but eventually was completed. 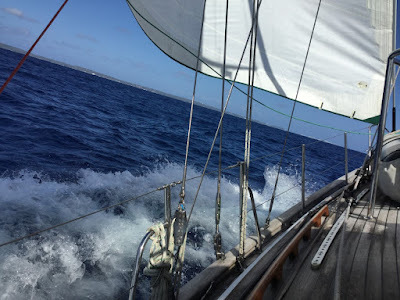 After about one hundred miles the wind had clocked to the NE and the seas became less irregular, also from the NE. We were sailing and feeling much better. Late in the afternoon Mags noticed our house battery charge was getting low. After a bunch of checking I found a connection from the solar panels that had melted and failed. After repairs it still did not seem to be getting the afternoon charge it should so we decided to motorsail again to provide power to the autopilot. We travelled through the night with only one more incident when the Jabsco transfer pump spun its impellor while trying to refill the day tank. Fortunately we have spares and after again cuddling the hot engine in a sweltering engine room in the middle of the night the new impellor was in and the fuel transferred. The worst part of fuel issues is that you cannot relax, you are constantly concerned the engine will stop at the most inopportune time. Finally dawn came and Mags got some land fall photos of San Andreas in the distance as we approached the entry buoy. While we were dropping and stowing the sails to enter the channel through and behind the reef into San Andreas we had an Armada Maritime large inflatable with 3-300 hp engines and pilot house on it approached and wanted to board. We of course invited them on as we continued up the channel, Mags at the helm. 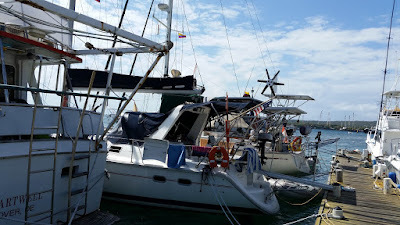 Four very friendly young naval personnel and a beautiful golden Labrador came on board, checked our documents, opened most compartments and sniffed everywhere, the dog did the sniffing and they left us just prior to our arrival at the only marina in San Andres, Columbia. to the dock at Nene's Marina. We decided to opt for the Marina because I thought I may need power to solve the charging issues and possibly have the fuel in the tank polished. We are stern tied to a dock on the Malecon. The marina staff are friendly and were patient with my inability to smoothly Med-moor. The water is clean and a beautiful blue. Palms and bright colours of the Malecon at the Marina. The street in front is a frenzy of activity with motorbikes and scooters to rival any Asian city. We have done a little walking in the town and as a duty free resort for wealthy Columbians it is teeming with activity. Kanilela has her encrusted salt washed off and sails all stowed. The two nights sleep have been glorious and tomorrow we plan to take the dinghy out to the reef for some snokelling.